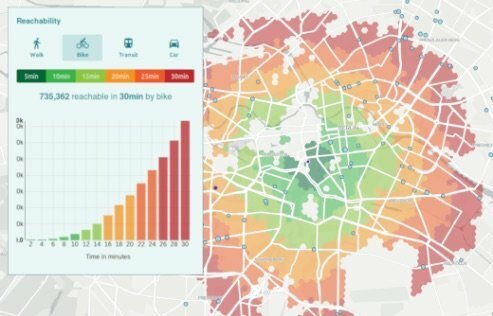 Location Intelligence is a rapidly developing science-driven discipline that aims to enrich business intelligence processes with relevant insights from geodata. Location intelligence deploys the latest technologies to collect and manage location data, enrich it with other data sources and add multiple contextualization layers. The findings of the complex analytics are used to optimize business models and strategies. Consequently, locational intelligence is a key enabler of almost all digital transformation processes, systems, and applications. At Targomo, we believe that meaningful location intelligence is always driven by understanding people’s complex movement patterns—and we are dedicated to continuously turn our geospatial research into business value. Our vision is to make powerful geospatial analytics accessible to people on all professional levels. At the beginning of every analytics process, Targomo’s platform integrates different, heterogenous data sources. In particular, this involves customer or project-specific data (e.g. branch addresses, sales, customer data), open data (e.g. statistical age distribution, Points of Interest, competitors), and, if needed, external data (e.g. purchasing power, movement data). Subsequently, Targomo’s precise reachability and mobility analyses evaluate all data based on their geographical location in relation to a specific starting point. A detailed structural analysis correlates the individual data points and uncovers complex interdependencies. The use of comprehensive statistical techniques powered by artificial intelligence allows the identification of the environmental factors that are decisive for the success or failure of a site. Understand, predict and improve the performance of your entire location network. Calculate the ideal route between multiple stops and plan delivery centers as well as supply areas. Provide the most personal, interactive real estate search on your platform and increase your customer retention.